For the first time in more than a decade, Samford University will have a team in the championship game of the National Intramural-Recreation Sports Association Flag Football National Championships. The nine Samford students will travel to the University of West Florida in Pensacola Jan. 2-4 for the national championship. This current team is comprised of seniors John Michael Haddad, Luke Kennedy, Blake Dunshee, Brent Hanson, Ethon Barnard, Will Cavanaugh, and Michael Moye and sophomores Carson Kennedy and Richard Barnes. The seven seniors have been playing together since their freshmen year at Samford and have been in the university’s intramural championships for the past three years in a row. To reach the NIRSA National Championships, the team landed several victories earlier this fall. During regional tournament play, they had a first-round bye. During the semifinal game, they defeated a team from North Carolina A&T University by a score of 20-12. 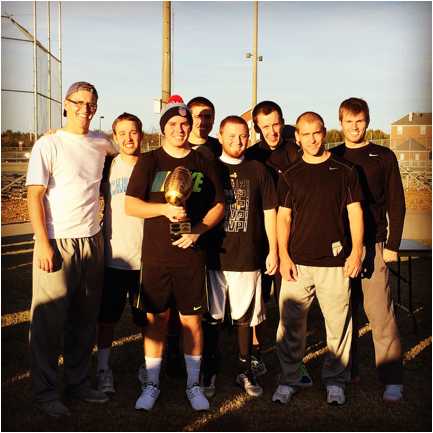 They also defeated a University of Tennessee-Martin team 21-9 to win the tournament. During this tournament, Luke Kennedy was named most valuable player and Haddod was invited to play on the all-tournament team.